It is my desire to build up my fellow followers of Jesus Christ, to help equip His Body for the work of the Ministry. These are just some simple thoughts of mine, taken from my daily time with the Lord and His Word, the Bible. It's my prayer that God blesses you through this simple servant of His. The more life I live, the more I seem to realize that I'm not quite the man of confidence that I sometimes think I am. That isn't easy to admit, but if most of us guys were honest with ourselves, we'd come to that conclusion. Case in point: a couple months back I decided it was time to change the rear brakes on the minivan. Brakes for me have become a rather easy job. Disc brakes, anyway. And since I had just a couple months before this occasion changed the front brake pads, I thought that this would be a quick, easy fix. After all, the rear has disc brakes, too. Boy was I wrong. Not in the actual brake job. The pads were easy to fix. But the last place to put tires on apparently cross threaded the lug nuts on 3 of the studs, and when I cranked the tire iron, it snapped the studs. I lost a couple studs on the right side after successfully changing the pads on the left side. I decided I'd better go buy the studs and prepare to replace them. I did my homework, and found videos on You Tube teaching how to replace broken wheel studs. Finally, I was prepared. I presumed for sure that I could handle it. I went to do the repair behind the church office, and got the 3 remaining lug nuts off. I now had one good stud. But I didn't have a hammer big and heavy enough to knock the broken studs out. Finally, after a couple hours of trying, I gave up and called help in from one better equipped for the job. He drove over, and with one swing to each, he removed the broken studs. I was happy, though I had been humbled. I learned some things that day. Did you catch that? I'm pretty certain the bold type doesn't appear in the Hebrew. But it sure jumps off the page as if it did. This wasn't just a regular guy-at least not anymore. This was the king! This was the newly anointed leader of God's people. Like an old Sesame Street segment, I think I need to find the one thing that just doesn't belong. Why on earth is a king plowing the field with oxen? Shouldn't the dude have people for that? I mean, if I'm king, y'all, I'm appointing people for that kind of work. I'll sit in my air conditioned throne room, with my mega 1080dp 16:9 man screen and watch ball games (obviously translating this to modern times!) while the more laborious tasks are done by others. Maybe it's a good thing I'm not the king, eh? But that isn't what we find Saul doing. He was king, yet he was plowing the field. What humility! The Bible says that at his coronation, he was hiding, even though he stood head and shoulder above everyone else. He was hiding among the baggage. Samuel had to search him out. He reluctantly took the crown. With all the bad (and deserved) press Saul gets in the Word of God, the man had a good start. He was a humble, broken man. I think we'd do well to study this early period in his life as leaders. Pastors, take note. Youth workers, this applies to you. In fact, I don't care if you head the janitorial staff in your ministry or workplace; all leaders need to study this. True leaders aren't born that way. They start really as good followers. They start as good learners, taking direction from those over them. This isn't a place for a presumptuous confidence like I had when it came to those pesky wheel studs. That isn't all, though. Look at what Saul did when the news of the besieging of Jabesh-Gilead reached his ears. He burned with a holy, righteous anger, and he mustered the troops and rushed to the defense of his people. And did they ever clean house. But what's interesting is that for some reason, Saul is given another conronation, Samuel again emceeing the event, as he did the first time. Why did they do this twice? Isn't it a bit redundant? Not really. Let me explain. Saul was no question king. Yet, in the eyes of the nation, he had proved himself. When trouble came, Saul got busy and executed a plan (not to mention the enemy!). He didn't just wear the title; he showed that he had the intestinal fortitude to do what had to be done. How many leaders today have this? How many pastors and ministry leaders really have the guts to make the tough decisions when the need arises? Do I? I have to ask myself that. I may be a pastor, and my church may accept me as such, but when push comes to shove, do I show it by my actions? It could be as simple as returning a phone call, or paying a visit to the hospital to see a sick or dying person. It may be stepping up to the plate against the false attacks of the enemy as he uses those around us. A leader isn't a leader in name alone; he/she is a leader in deed. This is a time personally for me to examine my own motives for why I do what I do. Why am I a pastor? Am I operating in the humility God requires? Am I able to make the tough decisions to cause God's Kingdom to grow? Am I proving, not just to those I'm charged to lead, but to myself that I'm who I should be? That I'm truly walking in the call on my life? If you're a leader, no matter the area, I implore you to reflect on these questions. Let the light of the Word of God illuminate your heart and your motives. Two Saturdays ago was a really special day in the Richard household. After a fun time of rotating my tires, we took the kids to the mall for a bit of shopping in preparation of the girls' trip to Michigan in a week and a half. (Even I got some stuff. A couple shirts and a cool pair of shorts!) After that, we swung by Toys 'R Us for Jayden's gifts for his birthday, and some good grade gifts for all. We rounded out the trip by grocery shopping at Walmart. That was when the fun was to begin. After returning home, we put the swimsuits on and headed to the pool. Timmy and the girls spent some water time in water wings. But then the girls took them off and practiced swimming. I have to say, I'm impressed with their progress. Machaela was doing great, actually off swimming all by herself. That's a big deal. She just learned how to swim in the past couple weeks. Machaela was next. She's come a long way, but she needs to practice where she can't touch bottom easily. So, I made her get out with me, and I jumped in the 9 foot end off the deck. I helped her in the pool, and she was swimming in the deep end! Not only did she successfully do it, she wanted to go back! I think that God is a "deep-end" God. God calls us, like Peter, to step out of the boat-the boat that represented safety and comfort. He calls us to follow Him in faith. Faith is total trust in God. Thanks to much of Christian media these days, we get a skewed version of faith. We are taught by many preachers that faith is the magic formula to get the things we want. We're told that if we have enough faith, God will shower us with our desires, like money, cars, etc. It always seems to be material things that are pushed. Or it's healing. "If you only had enough faith, God would heal that cancer! ", or whatever disease plagues us humans. Friends, God does bless us. And God heals. God does honor faith. But faith isn't the magic wand that moves God. Faith is trusting God. Faith swims where our feet can't touch bottom. Jonathan represented this kind of total faith. While the army of his father, the king, sat idly around waiting for another sign from God, Jonathan decided to simply attack the enemy God commissioned them to destroy. With only his armor-bearer with him, he stepped out in faith and went to battle. His only thought prior to advancing? "Perhaps God will work for us." Notice that he didn't sit down with his men and discuss it. There was no board room session or counsel to guide him. It was total trust in God, not knowing the outcome. He dove in the deep end. And God honored Jonathan's faith by giving him and his armor-bearer a huge victory. It's easy to sit on the pool steps all day. And you can feel as if you are really swimming. But you aren't swimming till you leave the poolside and get your legs off the bottom of the pool. A life of faith isn't meant for the shallow end. My kids took a chance and trusted their daddy. They had the blessing of success. Won't you do the same with your heavenly Father? I love being outside in nature. I'm not an environmentalist by any stretch of the imagination, but there is just something about seeing this natural world in all its fullness. I think of the whale-watching trip I went on in off the coast of San Diego, as huge grey whales surfaced and shot blowholes of water dozens of feet in the air. I think of the trips to northern Michigan with my family as a kid, camping out in the wooded campgrounds and state parks. The beauty of nature, the trees, the sand dunes, the wild animals, it all gets me. Even today, I love making beach trips in my current state of Florida. I enjoy wading out into the Gulf of Mexico, standing still and letting the force of the surf hit me. Or simply standing still in the water and watching the schools of tiny fish encompass me thrills me. I love what the natural world has to offer. But when I see this beautiful world, it isn't simply an end in itself to enjoy its splendor. No, I take it one step further. When I see the beauty of this world, I think of the God who made it. The perfect order, the complexity point to one thing: nothing like this could simply come out to be on its own. Obviously, a brilliant Mind was behind it. That Mind belongs to the Lord God Almighty. So all the majesty of the mountains, the power of the sea, etc., are evidences of the work of God. Think of the stars for a moment. All the stars in the universe are literally beyond our ability to count. A light-year is the distance light travels in one year. Since the speed of light is 186,000 miles per second, that means that light travels nearly 6 trillion miles a year. If that isn't encroaching on mind-warping for you, then get this: the Milky Way Galaxy's diameter is 100,000 light-years! And that's just our galaxy! It's only one of the billions in our universe that we can observe! Is your mind burning out yet? Mine is! That, my friends, all falls under the category of creation. God made it. That means that God is separate and distinct from His creation. He is all-powerful, far above this universe that to us is unfathomable! There is a fancy theological term for this. It's called the transcendence of God. God is not only separate from creation, but far greater than it. The Bible states this fact unequivocally and unapologetically when it says it simply, "In the beginning God made…"
The Bible, in Psalm 147:4, makes the statement that God determines the number of the stars, and (get ready) He names each one! (See the 4th verse). I get my kids names mixed up all the time, and there's only 4 of them! That speaks to God's transcendence. But the verse prior to it says something equally profound. Its says that God binds up the brokenhearted, and heals all their wounds. (See the 3rd verse) There's also a fancy theology word for this one, too. It's called the immanence of God. That speaks of God's involvement in His creation, in our lives. Let me tie this all together now. We all have heard how God cares for us. We know He understands our hurts, our pains. We are familiar with the 3rd verse, some of us rather intimately. But I want to challenge you to look at verse 3 in the light of verse 4-that is, God not only cares about you and your problems, He has the means to do something about it! Don't think God is too busy with other issues, like keeping the stars in their proper places. He holds the stars, but friends, He holds you too! God is not an unconcerned landlord over this universe, and that includes you. Friend, I believe the ultimate expression of this All-powerful God's immanence is found in Calvary, as God in the flesh (see John 1) hung on that cross in the person of Jesus Christ. God got intimately involved with His people that He made, making a way for us to be free from sin. He died on that cross for our sin, and His blood that He shed washes away the sin and the guilt that comes with it. He loved us enough to intervene and save us! I had an interesting thought this morning that may possibly been a God-thought. Bear with me, I'm still working this one out, but I think something is there. As I sat in church Sunday morning, the preacher, overseer of the Spanish Churches of God here in Florida, spoke out of John 9, about the healing of the man born blind. It was a great message, but as sometimes happens when someone is preaching, one little part caught my attention. If I were to ask you what the miracle was that happened in this chapter, you would most certainly tell me it was Jesus healing the poor blind beggar's eyes. And you'd be right. But I'd like to offer that while the opening of his eyes was indeed a powerful miracle, there is another here that I've never really thought of until now. The miracle of note wasn't the blind eyes opened, it was what God did in the life of the man who was blind. He didn't just go on about his merry way when the Lord healed him. He had been deeply touched by Jesus, and he minced no words about it. Names were important in the Jewish culture. When a child was born, he was given a name that had significance. It could have been a prophetic name, like Moses. When Pharaoh's daughter found him in the basket, she gave him the name Moses, which means "drawn out". To her, it simply was commemorative of how she met the baby. What she didn't know was that it was a prophetic name, for Moses would be used by God to draw out the people of Israel from under Egyptian slavery. Some were named to mark something significant, usually to the bad. Jacob made his grand entrance into this world trying to one-up his twin brother, who was the first to pop out. He had has hand on his brother's heel. Some he was called "heel grabber", which can also mean "deceiver". It was also prophetic, as much of Jacob's life was spent trying to con and deceive others. Then there is Jabez. We are all familiar with his story, and I'm not going to talk about his prayer. You can read that book. Jabez was given a name that surely welcomed scorn. His name meant "pain". His mom maybe had an especially painful birth, or maybe the birth was accompanied with some kind of hardship. Whatever it was, Jabez's mom decided to remember it forever in the name she gave her baby. The cool part is, Jabez didn't let that name stop him. He didn't let it become prophetic. He did something about it, and he was honored for it in the scriptures. What does any of this have to do with a guy in the first century who was blind? He was also a man with a destiny of pain established for him. His lot in life had been set. He didn't do anything to deserve it. He was born that way. Much of his life was spent begging for a living. When the disciples of the Lord found him, they asked Him whose fault it was that he was born that way. His, or his parents? I love the reply of Jesus. "Neither this man, nor his parents sinned. But he is blind to show the works of God in him." (paraphrased) Jesus healed him, and the next thing we know, the guy is preaching to the Pharisees! Usually the healed couldn't go away quietly. They told everyone they saw what Jesus did for them. So this guy is brought before the religious leaders and interrogated as to how he could now see. He looked those preachers square in the eye and told them what Jesus had done for him. The miracle I see is really the change of heart and boldness in his life. He could have remained quiet. But it's hard to stay quiet when the Lord has touched you. Like I said, this is still incomplete, but I'm journaling it out here. There is much more to come. God bless! Its Christmas Day 2009, with just about 1 hour left in the day. And, like every Christmas, the kids made out like bandits with gifts from mom and dad, grandparents and great-grandparents, and a great-aunt and uncle. Among the spoil were Legos, Lincoln Logs, some RC cars with ultra-bright blue and red LEDs, a Dippin' Dots maker, a Pixos art machine for each girl, and jewelry boxes. But one gift emerged as daddy's favorite. It's a book of paper airplanes! Specifically, it has ten different airplanes to make, some gliders, some darts, some stunt planes. There's even one plane, called the Hurricane, which is a circle. Timmy and I had a lot of fun making airplanes and throwing them across the room. As I sat there tonight folding paper, I found myself taking a venture back to the wonder I experienced as a kid making airplanes. Not just the fun of tossing them across the room, but the work that goes into them. To make a good plane, you just don't fold paper any old way. Each fold must be precise. What is done on one side needs to be done on the other. A paper airplane, to fly properly, requires symmetry. It's really kind of cool. As I was flying the last plane I made tonight, it hit me that paper airplanes brought out in me something that makes the Lord Jesus very happy-a childlike faith. He said to His followers, "If you want to enter the Kingdom of God, you must have faith like a little child" (my paraphrase). When I think of childlike faith, I'm not just thinking trust. While that is a huge part of faith, it's not the only part of faith. Think back to you childhood. Think back to that sense of wonder that you had. How was it that dad could mow the lawn, and instead of dying, a week later it was flourishing and in need of another mow? How could that Space Shuttle make it from that launch pad in Florida to outer space? How is it that a caterpillar morphs into a beautiful butterfly in about 2 weeks time in that tight chrysalis? Those are just a few of the things that put a sense of awe in us. When you go out tomorrow, I want to stop and look around. So much of God's creation simply passes by without us giving it much thought. We adults get so focused on "important stuff" that we become colorblind to the wonderful things the Lord has put here. We need to stop and smell the roses, to use a very tired cliché. Remember the commercials for a popular allergy medication? The one where someone is outside, but the shot is blurred and dull? Then the person pulls out the allergy med box, and the dull, blurry image peels away to reveal a vibrantly colorful and clear picture. That's what I think we need from time to time. Call it a spiritual antihistamine. Why spiritual when we're talking about a physical world we are in awe over? Because we need to see the world as it really is. It's the creation of our all-powerful God, who happens to be Spirit. When we can let our minds take in the wonder and majesty of creation, then we in turn should let it translate into praise for the infinitely creative God who made it. Instead of stuffy noses, we have stuffed up spirits. We need to get our sense of wonder back. I believe that we honor God when we explore and experience this world He made for us. He's made this whole universe as a vast backyard for us to explore. We not only have the technology to see the deepest places on earth, and the now unfolding catalog of new species to find in them, but we are getting glimpses of the awesome things outer space is full of. Distant stars exploding and imploding, beautiful nebulas, and new planets dazzle us. The psalmist was right. The heavens really do declare God's glory! I know that sadly, many of those who see these things daily don't translate it to faith a really big God. Honestly, I don't see how they don't. But the more I learn, the more I explore, the more I want to praise God. Why, just the human body alone is so impossibly complex that all I can do is give God glory. 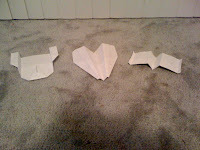 I never thought I'd find inspiration in a few paper airplanes. Till next time! OK, this is officially my second review of a Mark Batterson book (or any book for that matter!). As an avid reader, I have several authors that I enjoy. But I don't have too many that I can relate to on a level that is "real", for lack of a better term. I'm not a lot younger than Pastor Mark, and on that point alone I have a lot more in common with him than other authors I read. Pastor Mark's first book challenged me to chase a lion in the biggest move of my then 30-year old life, uprooting my family from our comfortable home in southeast Michigan to sunny central Florida, where we have really seen the providence of God in our lives and ministry. Now comes the chance to review yet another great book, Primal: The Quest for the Lost Soul of Christianity. So here goes. For some time, deep inside me, I've sensed a longing for what Mark conveys in the pages of this book, though I couldn't quite place a finger on it till now. Do you sense in your spirit and heart the need to reflect back on what a relationship with the Lord should be? That is exactly what this book is doing for me. It is a call for us to get past a surface faith that can develop in even the most seasoned Christian. This book calls us to descend back to what the heart of our faith is all about, namely, loving God with all our heart, mind, soul and strength. So, taking the Great Commandment referenced above that the Lord gave us, Mark takes us on a journey through each one, looking at the ways we love God in them. Do the things that break God's heart break ours? Does the wonder of God's creation awe us? The soul of our faith is often expressed in the wonder and amazement of what God has made. How about loving Him with our minds? We have the ability to continually grow in knowledge. But too many of us allow ourselves to stop learning at some point in life. God is honored when we don't stop trying to understand Him, His ways and His universe. Finally, love God with all our strength. In other words, putting some elbow grease into our faith. I used to attend a church that operated a large warehouse for benevolence ministry. We stored food and drinks there that we gave out both locally and around the world. But people had to maintain the warehouse, lest it fall into poor shape. Things needed to be put in order. I did that for a while, and each time I went home, I left with the sense that I had done something of value eternally. I was tired, but I felt that I had loved God with my strength. In my fast track through the Bible that I recently began, attempting (I said attempting, now!) to read the entire thing in 90 days, I am finding it both refreshing and amazing at the what I am picking up along the way. I haven't really come across things I've never seen, but I am being wonderfully reminded of many truths I've known for years, yet somehow ended up in the dusty reaches of my mind. Sure, from time to time, as situations would warrant, those truths would come out, but they aren't things that I'd thought and meditated on, at least not on any regular basis. Suddenly, the joy of God's Word, the pull of His Spirit, and the growth that results are overwhelming me. I love to pull out the truth of God's word, and get it into my heart. That is the part that gets me. When I read about the life of this man called Jacob, I am not reading a lot that says he was a man of faith that always made God happy. In fact, Jacob spent much of his life scheming, lying nd cheating to get his way. That was why he was on the run from his brother, Esau. Yet, in spite of his mistakes, his plans, and his scheming ways, God was with him! Even though he messed up royally, God didn't give up on the plans He had for this man. Friends, that is a comfort to me. I may not be a cheat, but let me be honest. There are times I let my own ideas get In God's way. There are times that my worries push me to lean on my own understanding to fix my messes. That is a big no-no, when one considers that the Scripture teaches that we are to trust in God, and not trust our natural understanding above God (Prov. 3). Yet, as much as I've messed things up, God is still directing my steps and making me that man He's called me to be. What does the New Testament say? "And we know that all things work together for good to those who love God, to those who are the called according to His purpose." (Rom. 8:28) That means to me that God isn't afraid of my mistakes. He doesn't wash His Hands of me when I fail. He picks me up, dusts me off, and uses that experience to mold me. Friends, God isn't joking when He tells us this precious truth. How amazing and how deep is His love and grace for us! Now, I know that God isn't trying to bring us into a physical piece of real estate as He was with Jacob. The Lord Jesus has place of promise for us, though. He has a destiny for us. He alone sees the final picture of what we are to become. So let Him work out His will in your life through this time of testing. It may be painful now, but the time will come later on when you will look back and be thankful for what you've endured. Once you've passed through, you will be able to say with confidence, "It was worth it all!" Just another hot, lazy Florida day. 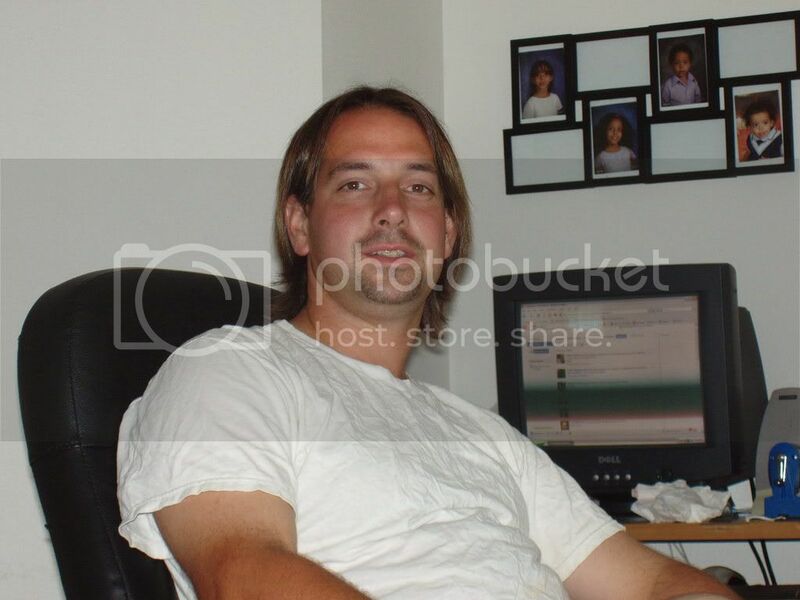 My name is Jeff Richard. I am a man that is first and foremost in love with Jesus Christ. He is my Saviour and Lord. I have a beautiful wife and 4 kids, 2 girls and 2 boys. On top of that, I am an associate pastor in Lakeland, FL. I certainly have my hands full!